Buying an engagement ring for a proposal can seem like an overwhelming task. Now that you’ve found the woman you want to spend the rest of your life with, declare your unending love and intention of a shared life with stone set titanium rings. For most men, purchasing a ring for their beloved with the intention of a proposal will be their first attempt at buying jewelry for their partner. To make the process a bit more bearable, we’ve put together a quick guide that will ensure you get your lady a ring she will treasure for the rest of her life. Consult Her Closest Friends – Carefully consider your girlfriend’s closest friends or family members and make sure they’re someone who can keep a secret. These people might be able to give you an idea on what type of jewelry she likes, and can help you select the right cut, gemstone and style that will guarantee a happy fiancé. Having an accomplice or two help you with this this task will be a great help. Decide on the Metal, Setting and Gem – When it comes to the band, there are plenty of choices. While gold is usually the more traditional choice, tension titanium rings are increasing in popularity because of their many beneficial properties. Titanium rings are strong, durable, hypoallergenic, and are able to securely hold precious gems and diamonds using tension to give the jewel a more pronounced sparkle. When it comes to the setting and rock, think outside the box. Other precious stones can replace diamonds at the centerpiece so don’t rule out emeralds and sapphires just yet. Consider your partner’s birthstone – that can make it so much more personal. Ring Size – If you don’t know your lady’s ring size, you can either have her friends find out for you or use one of her existing rings as a sample. Err on the side of caution and give the ring an allowance if you’re unsure, it’ll be easier to downsize a ring than go the other way around. Budget – Before anything else, consider your budget. Be smart about your purchase and refrain from digging yourself into too much debt by getting the best ring within your price range. We recommend stone set titanium rings, they possess beauty and elegance and cost a fraction of what other metals go for without sacrificing quality or appearance. Start Early – Don’t rush the process and give yourself time to handle all the details. It’s recommended you allow a period of at least six to eight weeks. This will give you enough time to search, plan, arrange the finances and put all the personal touches. When looking for an engagement ring, trust the best titanium jewelry company online and visit Titanium Style. Our focus is to create beautifully crafted, high-quality jewelry that will last a lifetime. 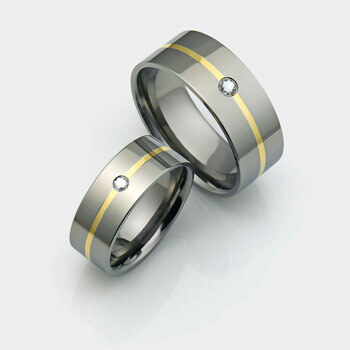 In addition to titanium rings, necklaces and bracelets, we also offer tungsten carbide rings. Contact us and let’s work together to give you a personally designed engagement ring your future wife will love.